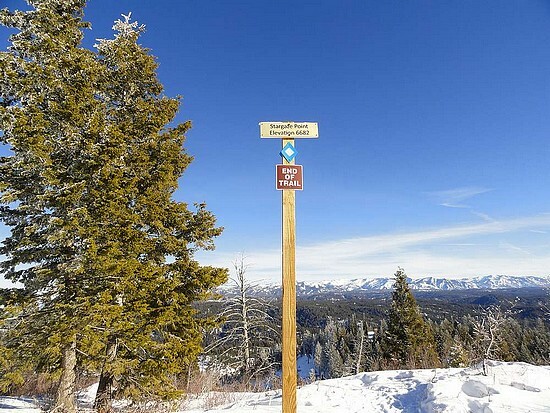 Stargaze Point is located in the Boise Mountains, between Idaho City and Lowman. There is a very well-marked trail that leads from Beaver Creek Summit to the Stargaze Backcountry Yurt. Stargaze Point is just a little further up the trail. This hike is highly recommended for families or anyone new to snowshoeing who wants to give it a try. The three miles round trip is very manageable. After snowshoeing up Pilot Peak earlier in the day, I had extra time and decided to give Stargaze Point a try as well. After parking at Beaver Creek Summit (park and ski permit required), I slapped on the snowshoes, and started heading up the Stargaze Trail. The trail was extremely well marked, and had both snowshoe and ski trails next to each other on the snowy road. This is the first time I’d ever gone snowshoeing on such a good trail, and the pace was quick. I saw three other groups on the trail along the way, so I imagine the trail gets plenty of traffic throughout the winter from folks using the yurt. The summit area is surprisingly open terrain with great views. There was even a sign on top marking the highpoint. I hung out on top for a while eating a snack, enjoying the views, and soaking in the sun. After that, all that was left was a quick hike back to the car. Map of the route, 3 miles and 700' elevation gain round trip. View of the route from the trailhead. Stargaze Point is on the right.